So the day before yesterday Highland Forest did something extremely lame and told us 3 days before our event that we could pretty much use none of the trails we’ve used for our race the past 5 years. Not only did they force us to bump the date up a month, but apparently everything East of the main park road is to be used for horseback riding only. Bicycles scare the horses. After quelling our initial inner rage, and spending a few hours in the woods, we all calmed down, and made some dang tasty lemonade out of the basket of lemons we were handed. This year’s course is completely different, but we are pretty excited about it. 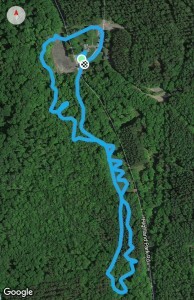 Less road, more woods, and some very neat classic cyclocross features (creek bed crossing!). You’ll be riding virgin trails we literally cut, shoveled, and raked yesterday. The more aggressive sections are generally less rooty, and since we are avoiding the main trails, there will be exponentially less horse pop! It’s gonna be rad! Remember the race is rain or shine! Don’t forget to bring your furry friends to participate in the just for fun Doggie Dash benefit for Cuse Pit Crew. A special thanks goes out to Brian Nilsson for rushing out and riding with us Wednesday, Neil Hueber for building trails on his day off, and Wes Hadzor!